The Norwegian/Swedish jazz power trio The Thing (saxophonist Mats Gustafsson, bassist Ingebrigt Håker Flaten, drummer Paal Nilssen-Love) has been active for 12 years at this point, and has released nearly as many albums, including collaborations with Joe McPhee, Jim O’Rourke, Otomo Yoshihide, Thurston Moore, Ken Vandermark, and a group called the Cato Salsa Experience. But to my ear, they’re at their best when it’s just the three of them. The combination of Gustafsson’s blustering, Albert Ayler-meets-Peter Brötzmann riffing and screaming, reed-splintering solos, Håker Flaten’s booming, thunderous (yet shockingly subtle) bass attack, and Nilssen-Love’s machine-gun, almost punk-rock drumming is one of the most potent sounds in jazz. There are and have always been plenty of muscular saxophonists in free jazz, from the aforementioned Ayler and Brötzmann to Archie Shepp, Charles Gayle, David S. Ware, and many more, but Gustafsson is that rare player who seems to have a genuine spiritual affinity for noisy rock as well, and his fellow Thing members share that raucous, nearly anarchic spirit. 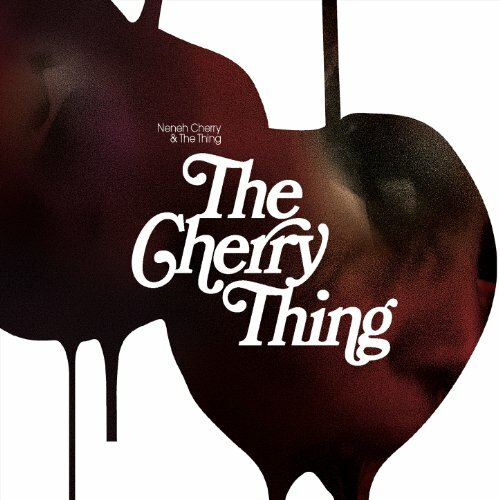 The latest Thing CD, The Cherry Thing (buy it from Amazon), is co-credited to vocalist Neneh Cherry, stepdaughter of Don, who had a hit single, “Buffalo Stance,” in 1988. On it, the quartet perform another of Don Cherry’s compositions—“Golden Heart,” one of the four themes that made up Side One of 1965’s Complete Communion. The lyrics Neneh Cherry sings may be hers, and new; they’re certainly not present in the original. The group also tackles “What Reason Could I Give?”, from Ornette Coleman; the Stooges’ “Dirt”; Suicide’s “Dream Baby Dream”; Madvillain’s “Accordion”; Martina Topley-Bird’s “Too Tough to Die”; and two new songs: the Gustafsson-penned “Sudden Moment” and “Cashback,” with lyrics by Cherry. Some tracks work, others don’t. “Dirt” has a terrific rumbling energy, Gustafsson’s baritone sax approximating Ron Asheton’s guitar quite well, but Cherry’s vocals lack the punch of Iggy Pop’s on the original. “Accordion,” originally a hip-hop track, becomes doggerel and nonsense when its lyrics are sung rather than rapped, and while the band manages to work up a decent groove, Gustafsson seems slightly lost. Ultimately, the biggest problem with The Cherry Thing is that in making room for their guest, the guys are forced to restrain themselves; consequently, the lung-busting, finger-fracturing energy of albums like Garage, Action Jazz and Bag It! is lost. You can’t confine Mats Gustafsson to a preordained solo spot in the middle of a song, making him play Lester Young to Cherry’s Billie Holiday. It’s fine that they’ve demonstrated the ability to hold back under certain circumstances. They haven’t answered the question of whether, or why, they should. A few months ago, The Thing released Metal!, a double live LP recorded in April 2011 in Lithuania, on the NoBusiness label. On this album, they’re joined by British bassist Barry Guy, known for working with saxophonist Evan Parker and guitarist Derek Bailey and being a member of the Spontaneous Music Ensemble, among many other projects. The first 10 of its 11 tracks blend together into a seamless, largely continuous performance, and all are named for rare metals. The last, obviously an encore, is a run through “Ride the Sky” that’s less than two minutes long. Like the album with Neneh Cherry, Metal! is The Thing proving they’re not one-trick ponies. But unlike The Cherry Thing, this side trip is enjoyable almost from beginning to end, and doesn’t make me feel like they’re sacrificing anything vital in order to appeal to listeners seeking easy pleasure. In fact, Metal! is one of The Thing’s most challenging albums, which is probably why it’s a vinyl-only release limited to 600 copies. Get one while you can.